Are you looking at ways to speed up your debt free project? Would you like to find ways to get extra money to throw into your debt snowball? I finished reading Debt Heroes from Ben Edwards and Jeff Rose on Amazon and it’s a great read. The book’s release is a part of The Debt Movement. In case you missed my previous post about it, Good Financial Cents and partners like Ready for Zero have teamed up for a massive project – they’re hoping to get $10 million dollars of debt paid off in 90 days. The book’s goal is to help you get rid of your debt faster with Ben and Jeff sharing several real life success stories to inspire to achieve your dreams. Before I dive into what’s inside, I like to share some basics of the book. Ok, I usually don’t focus on price since I believe purchases should be based on their value, but this is a STEAL at 99 cents. I have no idea how long this will last, but if you’re sick and tired of being in debt and want to read something to not just motivate you, but get you started on becoming debt free. Why Do We Need Debt Heroes? They whittled down the list to 21 people who paid off over $1.7 million in debt. That’s right almost $2 million dollars was earn and saved by these ordinary people and used to get themselves debt free. Why do we need debt heroes? Don’t we have enough personal finance blogs, sites, and gurus to give us the tactics on how to get out of debt. I think that what this books does better than many money books out there is that it give stories us stories to motivate us into getting things done. Honestly, simply having that information alone doesn’t help many people. Many people get into debt, not from lack of financial knowledge (99% of us know to spend less than we earn), but they get into habits and behaviors which sabotage their finances. Presenting cases so that people can identify with others who had the same struggle can be incredible powerful. That’s what I see as the book’s biggest strength. Ben and Jeff’s book breaks down why these factors are vital and how you can include them in your own life. 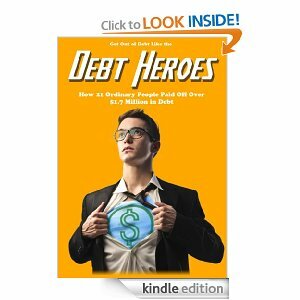 I think Debt Heroes is a great book for those looking to finally get rid of their debts and build their finances quickly. For less than a dollar, you can have an incredibly helpful tool in your pocket that you can use in your journey to become debt free. What tips do you have on keeping your finances in check? What is your strategy for paying off debt? By the way, if you’d like use ReadyforZero to speed up your debt free journey, you can sign up for a free account with them today.